On Tuesday July 4th, Assistant Superintendent Dehanne Augustine was officially named Deputy Officer in Charge of the Coastal Executive Unit (Ambergris Caye and Caye Caulker). Augustine's new position has her working alongside Officer in Charge (OC) of the Coastal Executive Unit (CEU), Superintendent Henry Jemmott. He previously occupied the Deputy position under the leadership of Superintendent Sandra Bowden, and took charge upon her transfer in November of 2016. Deputy OC Augustine was transferred from Caye Caulker, where she served her capacity as the Officer in Charge (OC) for over one year. As such, she has had a close working relationship with newly ranked Superintendent Henry Jemmott. Augustine told The San Pedro Sun that her portfolio includes community policing and domestic violence. “I have previous training, so I will surely utilize my experience and training in those two areas. Also, whatever community policing program is dormant, we are looking to strategize and see how we can come back on board. In regards to domestic violence, I am just looking at all of the cases we have now, and want to help sensitize the issue within the community,” said Augustine. She is also responsible for training services. “I fully believe that if you expect anything from the police officers, you have to have the proper tools. OC Jemmott has also assigned me to do in service training for all of the police officers. Sometimes they need reminders. By training police officers, we can hold them accountable at the end of the day,” said Augustine. She explained that not only will she be responsible for delivering and executing administrative duties, but she will ensure that the community oriented policing is vibrant. “We want to continue building that relationship with the community. Sometimes we want to take one step forward, but one incident between the police and community takes us three steps backwards. I am striving to emphasize on positive community building. The police department has a mission statement, and it says it you cannot do policing without the community because it is a partnership,” said Augustine. As part of the transition, whatever assistance or equipment is needed at the station, OC Jemmott stated that Deputy OC Augustine will be his right hand. “Not having a Deputy OC for so long, and now having one is a relief. It has been long overdue because the activities of San Pedro and the rapidness of how things are happening, we are always in need of manpower. By having a Deputy, it allows me the autonomy to do more things, and to extend my help to other people within the community. She will be assisting me, so I can be able to do a lot more community outreach,” said Jemmott. It’s been one week since Deputy OC Augustine has transitioned into La Isla Bonita, and she has been kept busy with several recent incidents. “It’s better that I get this experience right away, so that when the time comes, I will be able to move around and work efficiently. It’s a sad situation, but the experience is better now than later,” said Augustine. 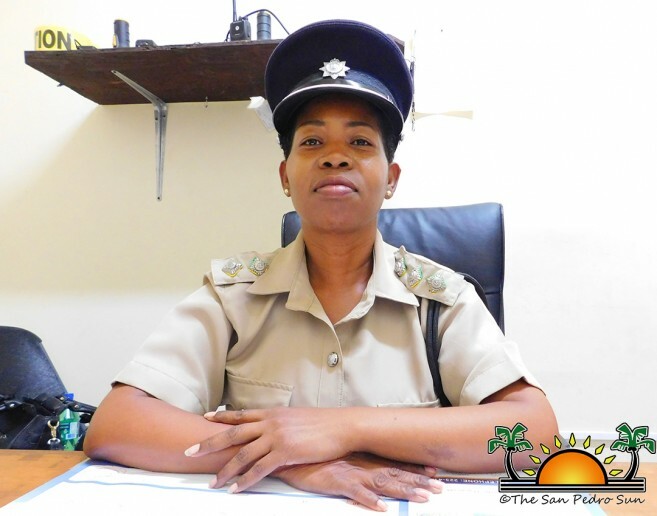 Deputy OC looks forward to establishing trust within the community, while making the island a safer place. The San Pedro Sun warmly welcomes Deputy OC Augustine, and wishes her the best in all of her endeavors!